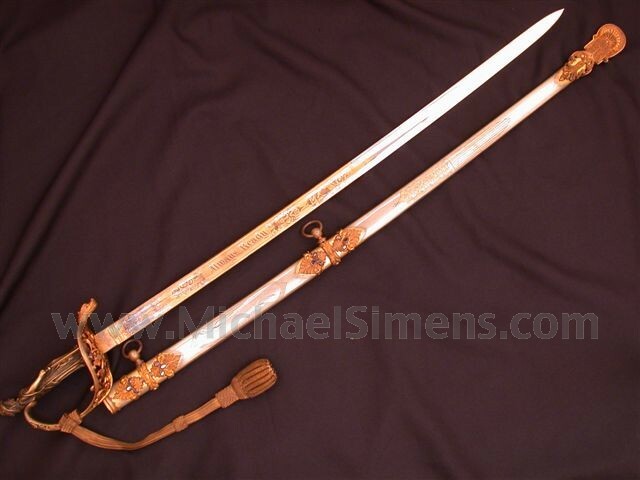 This particular sword is one of the finest offered by us, or any other dealer in quite some time. This is a "World-Class" artifact that should not be overlooked by any serious collector that demands both premier quality of construction and presentation as well as wonderful history. It has most every feature that any high-end collector could ask for and is of the highest caliber for its type. 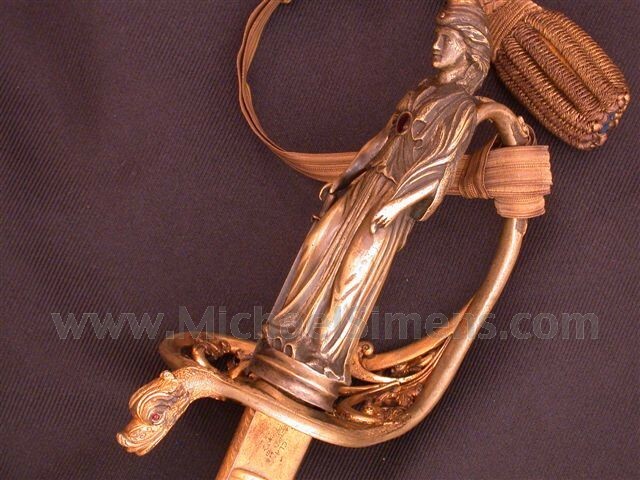 THE SWORD - The figural hilt on this sword is outstanding, that of the Goddess of Liberty holding a sword in her right hand. 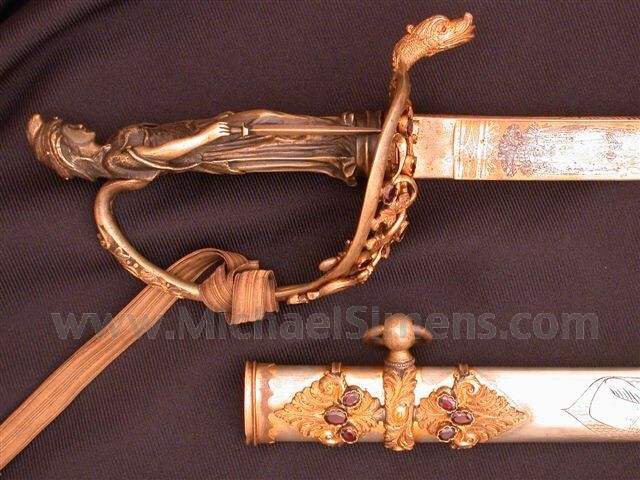 It is of German silver, finely detailed and is nearly identical to the grand presentation swords of Generals Egan and Mitchell pictured on pages 486 and 493 respectively in John Thillmanns inspiring work on the subject, save for the large garnet inlay of this example. The guard is almost unique, having been cast with a single outer bow with the interior scroll-work of vines and floral decorations being sweated on to the casting and then embellished with 9 oval-shaped garnets. 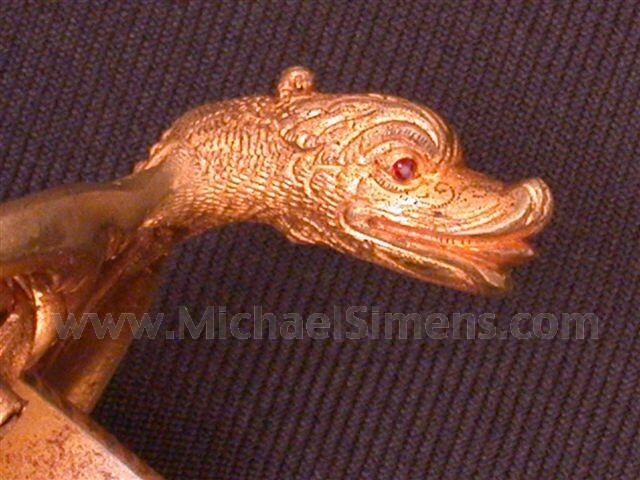 The quillon is a dragons-head set with ruby eyes. The guard shows 80 - 90% original gilt. 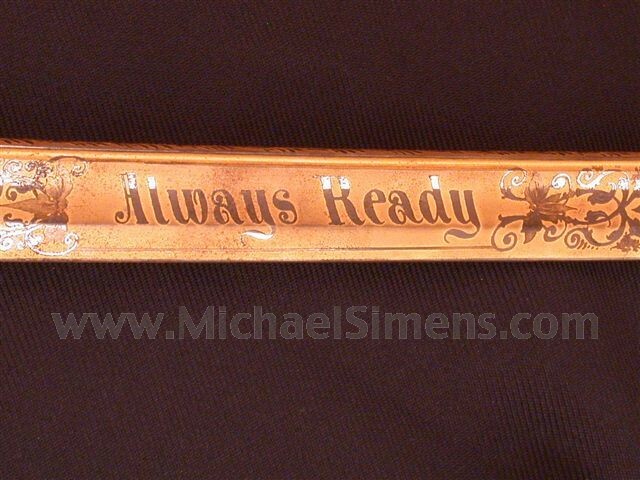 The excellent Clauberg blade is gold-washed with the motto, "ALWAYS READY" etched into its right side. 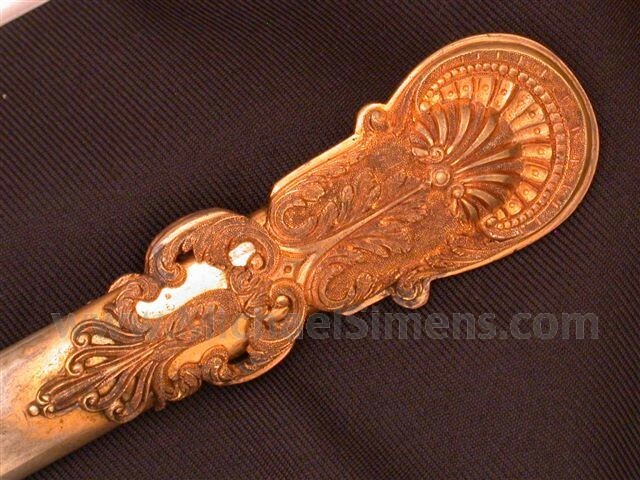 The blade retains 99% of its original gold gilt and shows the slightest scattered dusting of powdery fine specs of rust, almost unnoticeable. The un-etched surface retains an unblemished high-polish. 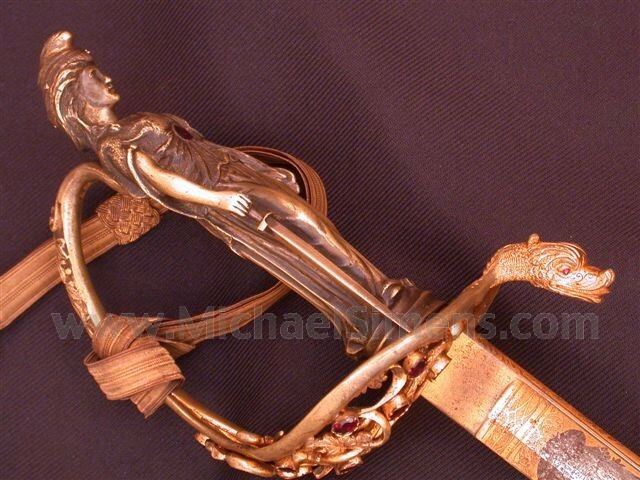 The scabbard is German Silver that originally had a heavy gold gilt. It now shows gilt surrounding the mounts as well as in the recesses of its finely engraved surfaces with the balance a clean and polished silver. 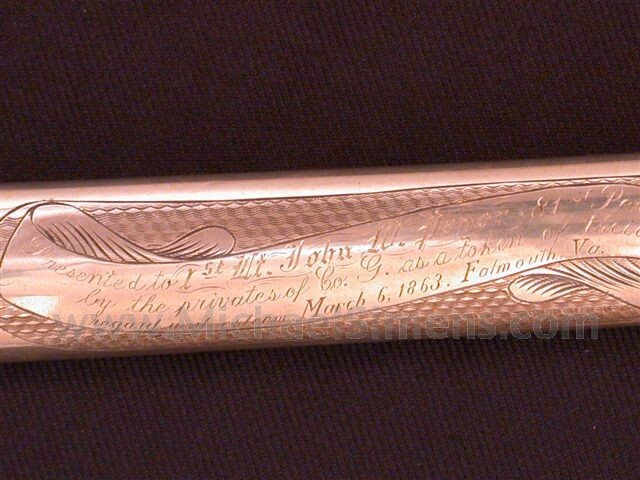 It is inscribed within a large, engraved panel, "Presented to 1st Lt. John W. Pryor / 81st Penna. Vols. / by the privates of Co. "G", as a token of their regard and esteem. March 6, 1863. Falmouth, Va.". The mounts are each fitted with 3 garnets on each side of the ring mounts and both they and the drag retain over 90% original gilt. THE HISTORY - I need not spend a lot of time in describing the war service of this man. One need only look up the 81st on the net to get a generalized history of this outstanding regiment who fought in virtually every major battle of the Army of the Potomac to include; Yorktown, Battle of Fair Oaks (Seven Pines), Savage Station, White Oak Swamp, Malvern Hill, Battle of Fredericksburg, Va., Battle of Chancellorsville, Battle of Gettysburg, Battle of the Wilderness, Spottsylvania, Siege of Petersburg, Mine Explosion, Sailor's Creek April, Appomattox C. H. April 9. Surrender. ************ Pryor served in the 2nd Pennsylvania Infantry during the Mexican War who saw action at the Siege of Vera Cruz, Cerro Gordo, and the Storming of Chapultepec Castle (Mexico City). With the 81st in the Civil War, Pryor took a shell wound to the chest at The Battle of Fair Oaks, was wounded in the foot, left shoulder and took a severe gun-shot wound to the left thigh at Fredericksburg, suffered a slight wound (I believe to the head) at Chancellorsville, and was raked with a severe gun-shot wound to the right thigh in the Wheatfield at Gettysburg. ************, Generals swords are nice, I prefer those of a FIGHTER !!! !